(London Post) The European Parliament has issued a blistering report criticizing Turkey over democracy, human rights and military operations against Kurdish militants. Turkey dismissed the accusations. The European Parliament (EP) issued sharp criticism of Turkey on Thursday, warning that the EU candidate country was “backsliding” on democracy, human rights and the rule of law, while calling for an end to heavy-handed military operations in the Kurdish populated southeast. “The overall pace of reforms in Turkey has not only slowed down but in some key areas, such as freedom of expression and the independence of the judiciary, there has been a regression, which is particularly worrying,” rapporteur Kati Piri said after the EP passed its annual progress report on Turkey. “We also express our concern about the escalation of violence in the southeast of Turkey, which caused almost 400,000 people to leave their houses,” she added. Responding to the report during a visit to Vienna on Thursday, Turkey’s EU Affairs Minister Volkan Bozkir appeared to deflect criticism on issues of democracy and human rights, instead using the nationalist card to slam the EP’s reference to the 1915 Armenian Genocide. As the successor state to the Ottoman Empire, Turkey denies an orchestrated campaign to deliberately wipeout Armenians in 1915. The report is largely symobolic as the EP does not control the EU’s foreign policy or enlargement policy. Resuscitating Turkey’s stalled EU membership bid was a key demand from Ankara to seal a deal to stem the migrant crisis hitting Europe. Under the deal Turkey agreed to take back illegal migrants who crossed the Aegean to Greece in exchange for Europe taking Syrian refugees directly, financial aid, visa liberalization and the acceleration Turkey’s EU talks. The concession over Turkey’s EU membership was viewed by many critics as undermining European principles. For Turkey’s autocratic president, Recep Tayyip Erdogan, it represented a symbolic victory to show his people that Turkey was advancing on its EU membership bid, an issue that was a focus of his government a decade ago but has since collapsed. Turkish authorities have cracked down on the press and freedom of expression, jailing journalists and confiscating newspapers in an attempt to turn all media into pro-government mouthpieces. While praising Turkey for taking in more than a million Syrian refugees, MEPs said cooperation between Turkey and the 28-member bloc on migration should not be linked to the EU negotiation process. “The EU should not be trading away values for an uncertain outcome. While we must work with Turkey to ensure refugees are properly sheltered, we must do so on its own merits, and not mix it with accession,” said Marietje Schaake, a MEP and member of the liberal ALDE group. Separately on Thursday, the Council of Europe, a rights and democracy body separate from the EU to which Turkey belongs, also expressed concerns over ongoing military operations against Kurdish militants in the largely Kurdish populated southeast Anatolia. The Turkish military has been conducting months of military operations and implemented around-the-clock curfews in several towns across the southeast in an attempt to dislodge Kurdish youth militia and Kurdistan Workers’ Party (PKK) militants. 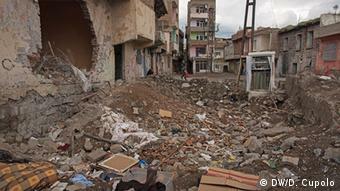 Large parts of Diyarbakir’s historic Sur district have been destroyed in fighting. Several hundred civilians have been killed, towns flattened and at least 400,000 people displaced during the curfews and fighting, which resumed last summer after a two year ceasefire and peace negotiations between the government and PKK broke down. The crackdown has been accompanied by the arrest of Kurdish politicians. The EP called for an immediate ceasefire and resumption of the peace process. The Turkish government has vowed to continue military operations until every last “terrorist” is killed or captured. The conflict has killed more than 35,000 people in more than three decades. Turkey-Greece tensions: What comes next ?